It’s a core piece of the conventional wisdom about home ownership: your equity is your security. 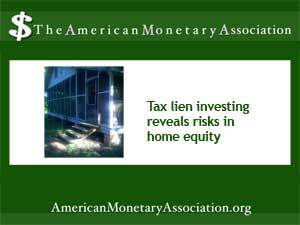 But a recent Washington Pot story about the often-unscrupulous practice of tax lien investing points out that home equity it took years to build can vanish in a virtual moment – a fate not shared by mortgaged property. According to the Ppst’s investigative story, a Washington DC homeowner lost his fully paid for home— with all its accumulated equity – all because of an unpaid property tax bill totaling just $134. The homeowner had a home worth nearly $200,000, which had been paid for in full two decades ago. But his property tax bill created the problem. In cases like this, the city can impose a lien on the property for the back taxes. Good product and long expiration date; arrived quickly. . Any trustworthy pharmacy will insist on a prescription from a health care provider who has seen you in person. Enter the tax lien investors, who buy up tax liens at auction and charge the homeowner interest and other fees for a few months. Then, if the debt isn’t paid, they foreclose on the property –leaving the homeowner with nothing. The practice of tax lien investing has been the target of the Washington Post's investigative report and is being monitored by housing advocates nationwide because of the practice’s potential for harming some of the most vulnerable homeowners – older individuals, many of whom are battling disabilities and illnesses. Is Retirement Hazardous to Your Health?